Amsterdam Sep 15 (IANS) Tibetan spiritual leader the Dalai Lama on Saturday opened a new exhibition in the Netherlands dedicated to the life of Buddha. The 83-year-old Nobel laureate who is in the country on a four-day visit inaugurated the exhibition titled "Buddha s Life Path to the Present" showcasing pieces by contemporary artists as well as ancient items Efe news reported. "Admire a wealth of thousands of years old objects and contemporary art from artists including Ai Weiwei and Yoko Ono " the Nieuwe Kerk Amsterdam (The New Church) said of the exhibit on its site. During the opening the Dalai Lama called for an "ethical revolution" saying religion had been a source of problems and division and that people needed to show more humanity and compassion because everyone is born equal. 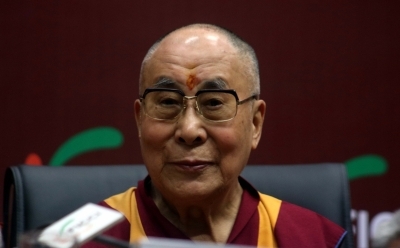 The Dalai Lama was also critical about what he deemed a lack of action when it came to tackling climate change. Among the pieces on display are an ancient two-metre high statue of Buddha dating from the fifth-sixth century AD and a 19th century Tibetan scroll painting known as a "thangka" loaned to the exhibit by the Dalai Lama himself. Marlies Kleiterp who manages exhibitions at the space said that the show was biographical in nature and the aim was to focus on the life of Buddha rather than Buddhism more generally. The show runs till February 3.